FingerTec’s marketing team has just returned from Russia, where it has participated in a 4-day exhibition held from 19-22 April at the Expocentre Fairgrounds, Moscow. 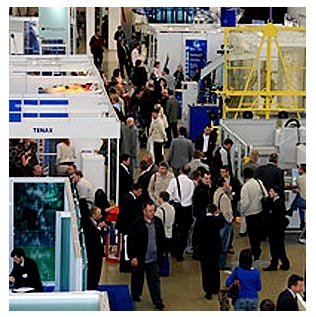 MIPS is the largest and one of the major exhibitions of security industry in Russia welcoming over 12000 trade visitors every year. It is a meeting ground for communication, safety and security industry developments in Russia and other CIS countries. As the local and international media stated, the Russian economy is coming out of recession faster than expected In the recent briefing of the governing bodies of the World Bank and IMF in Washington, the Vice President of the World Bank, Philip Le Wairua and Chief Economist of the regional offices, Indermit Gill, both highlighted that Russia is coming out of recession strong and more economically certain. The specialists called as "absolutely correct" strategy of the Russian authorities, aimed at diversifying the economy and improving its efficiency. The improvement of Russian economy is expected to cause a positive development of businesses in all industries including security and protection, and lead to increased aggregate demand for products and services. The positive dynamics of the Russian economy could also be seen within the walls of the exhibition. There were a large number of business representatives who were in search of new products in the market and wanted to establish new business partnerships. FingerTec has done a lot of work preparing its products for the Russian speaking countries. Our products, including terminals and software support Russian language and we offer various supporting materials, like manuals and technical tips, in Russian. Thus, we make sure, that there is no language barrier for our dealers and partners in Russian speaking countries, which is much appreciated by our current dealers in those countries. The localization of products and support materials was one of the major features that attracted our potential clients at the exhibition because it allows them to communicate with us directly and save cost and time needed for translation. Other characteristics of FingerTec products that amazed clients was the speed of verification, multiple verification methods, beautiful designs and variety of models that meet different types of requirements. Throughout the four days exhibition, our booth was quite busy with visitors not only from Russia, but also from other CIS countries, including Uzbekistan, Kazakhstan, Azerbaijan, Ukraine and Belarus. Besides meeting new clients, we also had a chance to see our current dealers. Thus, we had a pleasure to meet Mr Adam Kozdra from Carbomad, Poland and had a fruitful discussion on how to improve our business in the country. The exhibition has allowed us to establish contacts with many potential business parties in Russia and its neighboring countries and we are hoping that our discussions and agreements will grow into a mutually beneficial business soon.